We add the jQuery library and the trunk8.js library file to the database by adding them to the Web-Contents folder accessible via the package explorer. (Window–>Show Eclipse Views–>Package Explorer) and drag and drop the two libraries from your computer into the “js” folder. The trunk8.js plugin comes with a number of parameters which can help control how the plugin interacts with your page and how it displays the resulting trunk8ed text. width: 'auto' // style the final text to fit the container. We then apply the plugin to the page via a selector. In this example is I am going use the same viewPanel as, and this can be seen as an alternate to my original blog post regarding Dynamically expanding viewPanel rows. The parameters are fairly self explanatory and allow you to control the way the output looks. What I like about this plugin over others of a similar vein is that the width is dynamically calculated correctly and always fills the container. With a little more imagination you could have the “read more” link to a better tooltip or even click to open a dialog – because you can insert your own HTML the choice is yours – love it! 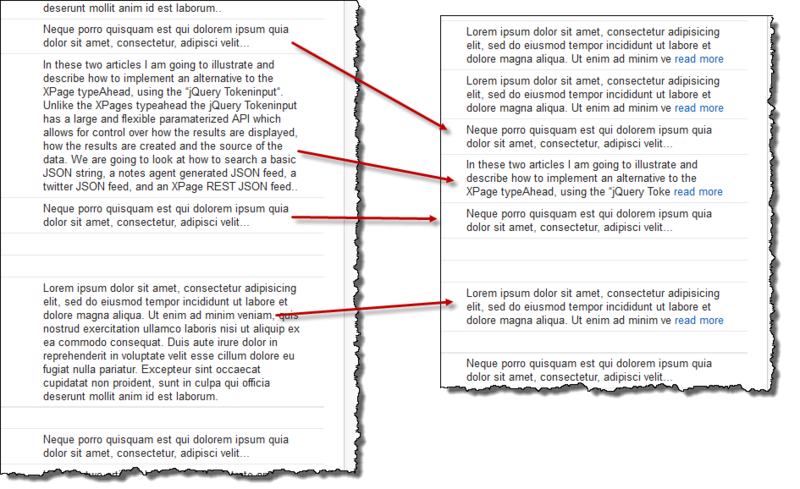 Every time I see a new plugin like this it just re-enforces to my why I evangelize using jQuery in XPages so much. It took me less than 10 minutes to implement the demonstration and took longer to write up this article. This is a real business requirement which is met with no effort at all on the part of the XPage developer. It’s a no brainer! Hi, I’m Rick, the creator of trunk8. Thanks for the excellent write-up and the great use-case! Cheers! Trying to figure out trunk8. I got an error and dont know what I am missing. I used jquery1.8 and just included trunk8.js file also block. but got an error on load. 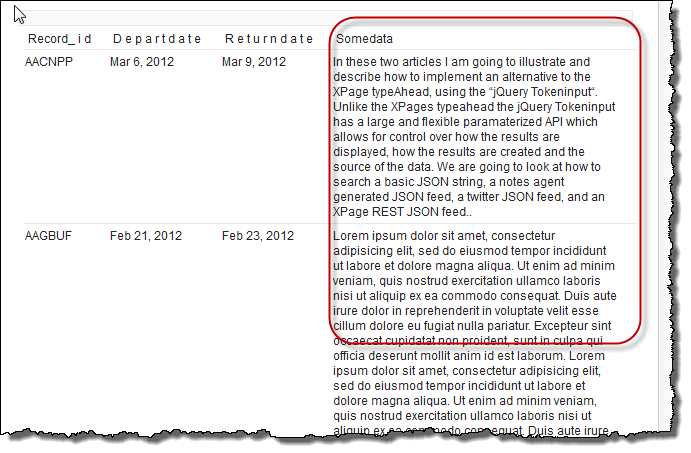 Do you have any idea or is there any dependent file to include on xpage. Two things I noticed with your error: 1) you need to use $ and not # at the start of the jQuery expression (this is not XPage SSJS) and 2) you are selecting the 9th row (incorrectly) and need to change tr :nth to be tr td:nth. By the way, great job man. Thanks a lot for these great samples. Nice work. The addition of the ‘span’ got rid of the markup, it now plays nicely in ie9 and the lines param also palys nice in FF and IE9. Thanks for the great demo of this plug-in you did on Ni9. Stephane – I have not tried it with a dataView (I don’t use them) but I think the greatest issue you will have is reapplying the plugin after every partial refresh. You can create a selector to replace the one I use in the example above to get all data grid tables and the column you are looking for. But if you expand/collapse a category or use paging the new data will not have the plugin applied. I suggest looking for an onComplete event which you can key into on the data grid and see if you can apply it there. then my question why I can’t use these? and the 3rd one is to this example, I find this trunk8 only works on chrome but not explorer….have no idea? ….sorry I DON’T KNOW IT CANT’S PASTE CODE HERE, CAN I SEND MAIL TO YOU? Sean – thank you for your kind comments, I am glad you like the database and examples. The reason you cannot use it is a straight resource is because dojo interferes with the loading of the trunk8 code. It has been mentioned a number of times in the XPages community – the solution is described here by Sven – http://hasselba.ch/blog/?p=1181. Ferry posted an alternate solution here in the XSnippets – http://openntf.org/xsnippets.nsf/snippet.xsp?id=hack-to-use-jquery-amd-widgets-and-dojo-together – in his example he uses select2, replace that for the jquery and trunk8 script codes and it should work for you. Let me know if that helps (and if I have understood your question properly) – I have your email address from the comment so if need be I can contact you directly. Btw which version of IE does it not work on – and do you have compatibility mode set on? and the other question is why I can’t use the newest version of jquery? should I use the 1.7.1 as my first choose?